Get ready for summer with a henna tattoo! 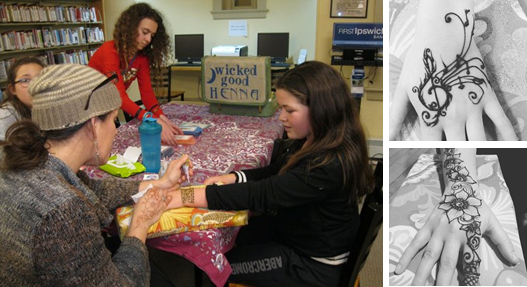 Mandy Roberge of Wicked Good Henna will be here with her designs and expertise to create a henna tattoo unique to you. Choose from her design cards or have her create one from scratch. Light refreshments will be provided. This program is for ages 12 to adult. Please register all people attending this event. Thank-you! ***Mandy makes her own henna and her henna paste is 100% safe for all skin types and is only a true risk (albeit non-life threatening) for someone with a citrus allergy. Ingredients: henna powder, lemon juice and essential oils (cajeput, lavender and/or clove). There is occasionally peppermint tea or coffee added to achieve the right consistency.